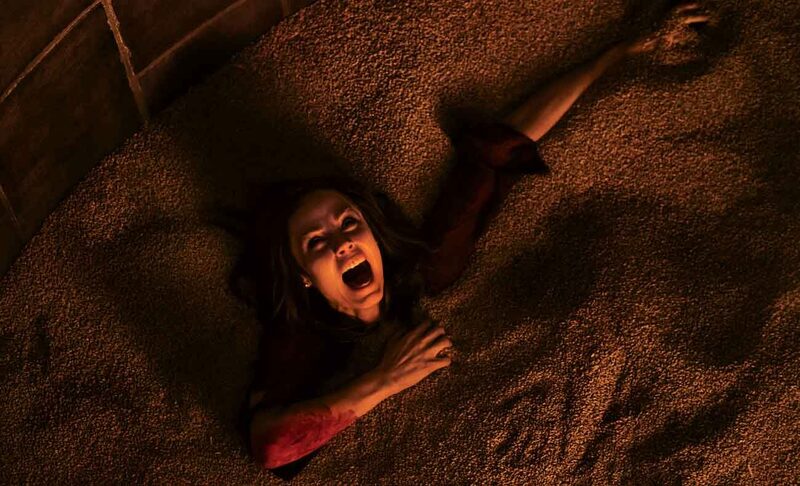 NEW YORK (CNS) — Butchery accompanied by siren-wail screaming, franchise shock value that has long since played out and a rapid descent into self-parody, this is “Jigsaw” (Lionsgate). The eighth, uh, film in the “Saw” series — which is now about seven and a half movies too long — has nothing new to say and far too much about it that’s familiar — most prominently, scenes of intricately choreographed torture and murder. The five trapped victims here, as always, face gross-out hacking in a series of claustrophobic enclosures. The cutlery deployed against them includes knives, circular saws and elaborate mechanical devices. First, of course, they’re taunted by a sulfurous marionette who tells them they must atone for past sins, typically involving the death of another person. Adding to the torment, the puppet, voiced by the evil Jigsaw on taped messages, tells them that there’s always a way out if they obey his commands. So the killer is, according to his own warped thinking, operating as an agent of morality. The doomed are picked off one at a time with a high gore quotient and a low budget. But wait, you object, having studied the matter closely, didn’t John Kramer (Tobin Bell) — known by the moniker of the title due to his custom of slicing out jigsaw-shaped hunks of flesh — supposedly die in “Saw III,” way back in 2006? Well, yes. But that’s no way to keep a franchise sputtering along, of course, so Ol’ Red Eyes is back. Not that directing brothers Michael and Peter Spierig and screenwriters Pete Goldfinger and Josh Stolberg give their villain much to do in his comeback. The film contains pervasive gory violence, gruesome images, including dismembered limbs, and frequent crude and crass language. The Catholic News Service classification is O — morally offensive. The Motion Picture Association of America rating is R — restricted. Under 17 requires accompanying parent or adult guardian.